The oldest part of Yharnam is located within the city's valley. Long ago, the Plague of the Beast ran rampant here, and in an effort to contain it the denizens set fire to the city, leaving little more than burnt-out ruins. The people of Yharnam have either forgotten about this place or are trying to forget it, but every so often, howls from beasts echo up from the valley below, a doleful reminder of their sins. Ritual Hall Fire: If you enter the Ritual Hall after Djura's Tower via Rafters, pay close attention to a pair of wooden planks sticking out from the corner. Attached to these planks is a rope with an explosive pot hanging from the end of it if you chop the planks, the pot will drop down and ignite a large bonfire on the floor below. The fire created by the explosion will kill a large number of the enemies surrounding the bonfire, and cause even the female Beast Patients to recoil from the heat, making things much easier. Blood-starved Beast Defeated: Upon defeating the Blood-starved Beast you'll receive the Pthumeru Chalice and one of the items you need to create the first in a long chain of Chalice Dungeons. In case you may have missed it, the other item you require can be found on the altar in the Ritual Hall. 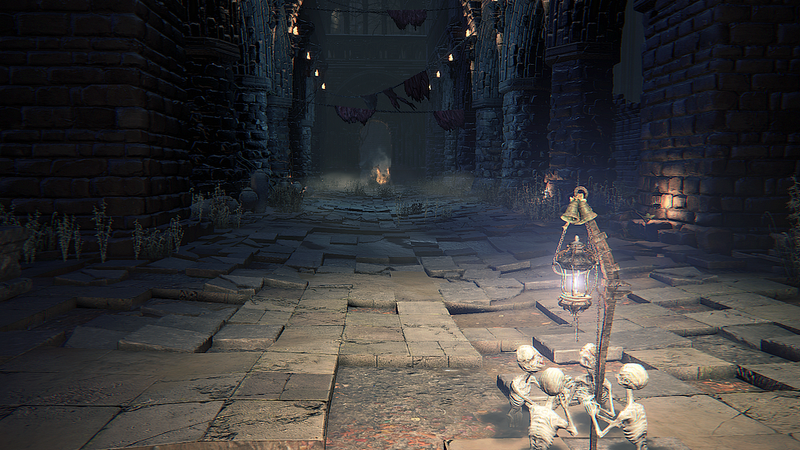 With both items and the Chalice in hand, you can return to the Hunter's Dream and create the dungeon at one of the Ritual Altars. While you can enter the dungeon alone at this time, the enemies inside would be difficult and it's recommended that you finish Hemwick first, so that you can attempt it at a higher character and weapon level. Graveyard of the Darkbeast: Despite this area being placed within the Old Yharnam, you can only access it through Yahar'gul, Unseen Village and face Darkbeast Paarl there. Going through Prisoner Holding Area and Dining Room, following the narrow path you will come face-to-face with Darkbeast Paarl, a fearsome creature that guards the route back into Old Yharnam Lower Parish. Upon defeating it, you'll acquire the Spark Hunter Badge to increase your shop inventory, and the Graveyard of the Darkbeast Lamp will become available. Before you leave, however, you should make sure to open the large wooden door nearby, so that you can use this Lamp as a shortcut to the back of OldYharnam if needed. If you came straight to this point after you entered Yahar'gul, it's worth returning to the Hypogean Gaol Lamp so that you can explore the area. Encountering this boss and you climb up Djura's tower without him seeing you, you'll be able to reach a peaceful resolution with him. Sinister Bell Ringer (Online): Bell Ringer is located below the drop from Hunter's Plaza with Djura's Ally. When “bell-ringer woman” is present, versus PvP invasions are possible. Old Yharnam | Lamp: This town is long abandoned. Hunters not wanted here. Old Yharnam | Charred Set: The red moon hangs low, and beasts rule the streets. Are we left no other choice, than to burn it all to cinder? Old Hunter Alfred: Found in the courtyard right before the boss battle. His summon sign will be on the bottom of the stairs as you enter the courtyard. You must have spoken to Alfred and agreed to cooperate with him. If you shift time into the Night, Alfred moves to his new position outside the Forbidden Woods, his summon signs disappear and won't be available for this boss fight. Defector Antal: When you drop down onto the narrow fenced path leading to Darkbeast Paarl, take a right to reach this summon point. You can only summon either Antal or Yamamura to assist you, not both simultaneously. Confederate : In plain sight along the path to the Graveyard of the Darkbeast after dropping from the cave exit. In order to summon Yamamura for this fight, you must first kill him in the Hunter's Nightmare and equip the " Impurity" rune. You can summon either Yamamura or Antal to assist you in battle against Darkbeast Paarl, but not both simultaneously. With patch v1.07 you are able to summon NPCs to come to your aid, just like cooperative play, including inside Chalice Dungeons. To do so, first you will need to acquire the “Old Hunter Bell” from the messengers in the Hunter’s Dream. In some areas you may be able to summon up to two NPC Hunters. Get the Hunter's Torch from the Rooftops. Get the Rifle Spear from the Storage Area. Defeat Djura at the top of his tower to get the Powder Keg Badge, or leave him alive for a peaceful resolution after completing Yahar'gul, Unseen Village (Evening). 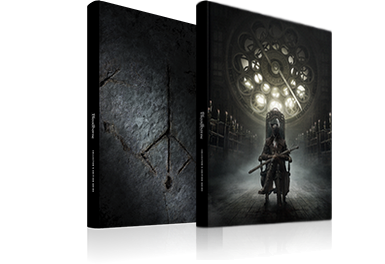 Defeat the Blood-starved Beast to open up the Healing Church Workshop, acquire the Pthumeru Chalice and cause Kidnappers to appear in various areas. Allow a Kidnapper to kill you in order to access Yahar'gul, Unseen Village (Evening). After going down the first set of stairs you'll enter the extremely dark basement beneath the Lower Church, and a Scourge Beast will come running from the shadows, so have your weapon at the ready. The pillars in the room can be very useful, as you can use them to impede the beast's movement while you can move to an advantageous position. When you reach the ladder after going the stairs from the dark room, you'll see an item on the other side of the staircase. To get the item you'll need to go down the ladder, and then go back up the stairs to reach the broken section of floor there. At the bottom of the stairway is a room that's home to the Old Yharnam Lamp. There's a small hallway to the side of this room, and if you go there and break the items along the wall, you'll find a hidden item. After kindling the flame on the Lamp, approach the nearby large double doors and read the warning notice; interact with the doors a second time to open them and enter Old Yharnam. While the main route through the area takes you over the bridge to the left after you pass through the doors, it's worth exploring the area down the stairs to the right first. As you approach the stairs you'll see a Wandering Nightmare just ahead of you, so quickly chase after it and try to kill it before it drops off the ledge; you can still catch it if it does drop down, but it's much easier to keep track of up here. Once it's dead, drop over the ledge onto the wooden platform and get the item there, and then drop down the series of rooftops to reach the ground below. If you head around to the back of this area you'll be able to find another item hidden underneath the archways. Returning to near where you first dropped into this area, drop down through the gap onto a narrow ledge below, and then once more to reach solid ground. In this area you'll find a one-way gate that will act as a shortcut later on; for now, continue along the path and go up the ladder at the end Upon reaching the top, drop down from the tower to reach the area you started in. As you start to cross the bridge Djura will start warning you to turn back and leave the area, and at the same time a Beast Patient will start approaching from the other side of the bridge. These enemies are one of the more common ones you'll encounter in Old Yharnam, so learning how to deal with them effectively will help you greatly in the long run. They are gravely afraid of fire, so if you have your Torch out they will spend most of the time shielding their eyes rather than attacking, which gives you the perfect opportunity to strike. Once you reach the other side of the bridge, the smoke given off by the charred remains of corpses will obscure much of your view over the area, so be on alert for any Beast Patients running through the smoke to attack you. The two paths leading around the sides of the building at the back of this area both lead to items, but guarding the one to the left is a female Beast Patient with a hooded cloak covering its head. Because of the hood this enemy doesn't fear the light of the flame in the same way as the others, so you need to be a bit more proactive when fighting them. There are a quite a few enemies in this area, but it's important that you do not venture forward past the large statue in the middle, because if you do, Djura will start firing at you with a gatling gun from his position high up atop a tower in the distance. From that point on you'll always need to be aware of your surroundings and make sure that as often as possible you have a wall or other solid object between you and Djura. If his gunfire hits you then you'll need to roll quickly to try to get back behind cover, because he won't stop shooting until he loses sight of you. The enemies are a mix of both types of Beast Patient, so lure the hooded ones towards you and take them out while the non-hooded ones cower from the flame of your Torch. To continue on safely, look for a small gap in the railings on the right-hand side of the area and drop down through it to avoid having to contend with incoming gunfire There are other routes you can take down to the floors below if you wish, but they bring with them a much higher degree of risk. The most direct method to get off the rooftop is to drop down from the front of this building, so that you land in the courtyard below. Not only will you take significant damage from the fall by doing this, but there's not much cover in the courtyard, so avoiding the gunfire can be difficult. Alternatively, you can go down the stairs on the side of the building to reach a broken doorway, through which you can cross a small hallway to reach the floor below There's a Beast Patient standing in front of the door, however, and you'll need to get past it while under fire from Djura - you may want to stand in the doorway and fight it, so that you have some cover. If you dropped down through the gap in the railings you'll land on a small ledge outside this room - quietly walk through the doorway into the room and you'll be able to sneak up on a female Ashen Blood Beast Patient, a larger and more dangerous version of the smaller ones. The beast will not have its back turned for long, so as soon as you're in range, used a charged R2 to stagger it and follow up with a visceral attack. The area down the stairs leading out of this room is lined with explosive pots and Djura has a direct line of sight over the area, so you'll need to be extremely careful. There are also a couple of Beast Patients to contend with, and it's best to clear them out first by running into the room to get their attention, and then quickly retreat back up the stairs to fight them behind cover. The short wooden bridge leading to this area is extremely exposed, so make sure you run across it as quickly as possible to avoid being knocked off by Djura's gunfire; heading to the small area to the side of the building and killing the Carrion Crows there is the quickest way to get out of his line of fire. There's a small gap just to the right of the church door that leads to a narrow path with an item at the end, but to get it you need to be very careful. Djura has a direct line of sight on the path, so you need to run to the end very quickly and hide behind the wall there until he stops shooting, before making your way back out. 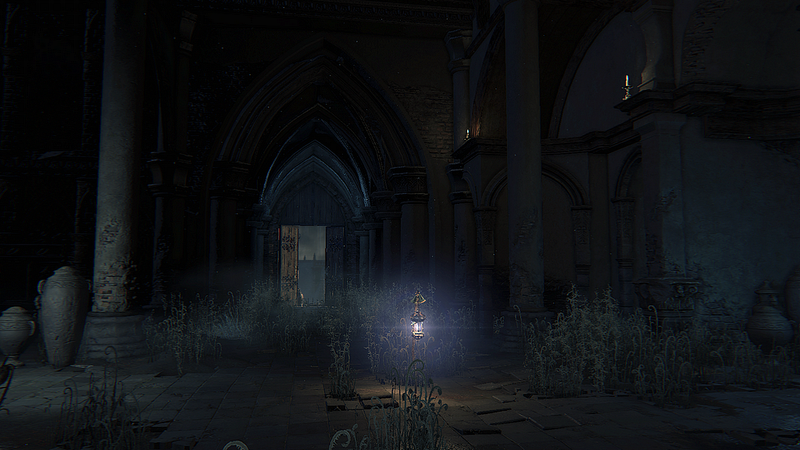 Entering the church itself is not without danger, because once you reach the middle, a female Ashen Blood Beast Patient will break through the door on the right. After defeating the creature, make sure you enter the small room it emerged from to find another hidden item. There are a large number of enemies in this courtyard area, and most of them are obscured by the smoke rising up from the piles of charred corpses. To make matters worse, Djura will start firing on you as soon as you exit the door, and while the trees in the middle of the courtyard can provide some cover, trying to fight all of the enemies out there can quickly lead to being overwhelmed. The safest way to take on the enemies is to quickly run out to awaken some of them, and then retreat to the safety of the building and fight them there. Once you've cleared out a number of them, run straight across the courtyard and fight the remaining enemies near the wall at the back, since Djura can't reach you there. As soon as you cross the bridge that leads to this area, Djura's Ally will emerge from the smoke that engulfs much of the plaza and start attacking you. This particular Hunter likes to keep his distance and use his firearm while backing away, so unlike other Hunters you may come across, he won't actually follow you very far if you decide you don't want to fight him. Since he rarely goes much past the stairs at the bottom of the plaza it can be difficult to fight him while Djura is still manning his gun. Your best option is to try to circle around the Hunter once he reaches the bottom of the stairs and cut off his retreat, keeping him in the small area that Djura cannot reach. Behind one of the statues at the rear of the plaza you'll find a small gap in the railings that you can roll through to reach a narrow ledge From there you can drop down through a series of ledges to reach a small balcony at the bottom. The doorway there will take you into a hidden storage area, where, after fending off a number of Beast Patients, you'll be able to pick up some very useful items including another Blood Gem from the chest near the base of the stairs. Half-way up the stairs you'll also be able to acquire the highly effective Rifle Spear, and at the top of the stairs you can get a new attire set. When you're ready to leave the area simply drop down through the doorway at the top of the stairs to land in a small area near the plaza - don't stay out in the open here, though, because Djura will open fire on you straight away. There's a locked gate in this area that can only be opened from the other side later, which leaves you with two possible route options. Heading straight up the stairs into the Ritual Hall is the most direct route into the building, and it's worth exploring at least some of the area there to get the items before returning here and going up the nearby ladder. The route up the ladder will take you to the rafters of the building, where you'll be able to create an advantageous environment for the battle on the main floor, so it's the recommended option. Once you reach the midpoint of the tower you'll have the option to climb another ladder to reach the top, where Djura is perched, or continue on to the Rafter's Access. There are a couple of ways that you can resolve things with Djura, so you'll have to make the choice as to how you wish to proceed. The first and most direct approach is to continue up the tower and kill him. Doing that will mean that you can freely explore the area below, and he'll drop the Powder Keg Badge for you. Alternatively, you can leave him alone and return here later after your first visit to Yahar'gul, Unseen Village for a much more diplomatic conclusion. If you face away from the ladder leading up to the very top of the tower, you'll see a small gap in the wooden railings that you can drop through to reach another wooden platform below. That platform will lead you through a hole in the wall and onto a bridge, where a female Beast Patient awaits. Try to lure the beast towards you and fight it on the platform, rather than the bridge, to avoid being accidentally knocked down during the fight. Once it's been defeated, cross the bridge and enter the Ritual Hall. Follow the wooden walkway from the other side of the bridge until the second turn, and then pay close attention to a pair of wooden planks sticking out from the corner. Attached to these planks is a rope with an explosive pot hanging from the end of it if you chop the planks, the pot will drop down and ignite a large bonfire on the floor below. The fire created by the explosion will kill a large number of the enemies surrounding the bonfire, and cause even the female Beast Patients to recoil from the heat, making things much easier. Just past the area where you drop the pot you'll come to a gap in the railings, leading out onto a beam that you can use to access another beam with an item on it. Return to the midpoint of the first beam and look down below to the left to see another walkway, and then drop down onto that to reach an item. From that item you should be able to see another walkway along the wall a short distance away, with another item at the end of it. To reach it you'll need to perform a running jump to cross the gap. You need to be quite precise with the angle and timing of the jump, because if it's too short you'll land on the walkway below the one you want to reach, and if the angle is too sharp you may fall to the ground. If you do miss the walkway, you can always make your way back outside and climb up to try again. Once you have the item, simply drop down to the walkway below, and from there you can either drop off the end near the exit side to avoid most of the enemies, or drop off near the entrance to take them on. While entering the Ritual Hall through the main entrance does not provide quite as many benefits as heading up to the rafters, there are a few items to be obtained, so it's worth taking a trip inside. There are quite.a few female Beast Patients to either side of the first corridor you enter, so you need to be careful as you make your way along it - if you haven't been up to the rafters, the enemy on the bridge across the corridor will drop down when you get close. A short way along the corridor you'll see an opening on the right, and if you go through it you can drop down a series of walkways, leading to an item. From there, you can only drop down to the ground floor If you continue along the first corridor you'll find another item near the banister at the top of the stairs, and halfway down the stairs you can exit out onto a large platform with yet another item on it, before continuing on to the main hall. It is very beneficial to drop the explosive pot. Not only will that fire give you a significant advantage in the battle (because it causes most of the enemies to recoil from the heat), but you can also lure or knock them into the fire for quick victories. Try to work your way around the fire, clearing out enemies on one side before moving, so that you keep the encounters manageable. If you came in through the main entrance then the battle will start when you first enter the hall. Once one of the enemies spots you a large number of them will come running, so try to force them through bottlenecks to control their movement, and never back yourself into a corner. The doorway and stairway you used to reach the hall make an ideal place for the battle, as you'll always be able to back up to create more space, and can even use the side door near the entrance to drop down onto the walkways. This lets you separate the enemies and approach them from behind. Regardless of which approach you take, once they've all been defeated, make sure you claim the items on the altar at the back of the room, because they're used in creating Chalice Dungeons and you'll be acquiring your first Chalice soon. Upon exiting the Ritual Hall you have the option of heading left or right Going left will take you to a small dead end area with a number of Carrion Crows and an item, while going right takes you along the main path Near the end of this path you'll come to a small bridge on the right, but before going across it you should take the time to investigate the doorway a short distance past it. This doorway leads to a ladder that you can climb to reach the other side of the one-way gate you passed earlier, near the Ritual Hall Exterior. By unlocking this gate you'll create a shortcut that allows you to bypass the Ritual Hall on subsequent trips through the area. Although this room may appear empty, the smoke and the pillars are in fact hiding a number of Beast Patients, lying on the ground just waiting to ambush you. Before dealing with them, however, your first focus should be on trying to kill the Wandering Nightmare that's hidden behind the pillar at the far end of the room. The easiest way to do this is to run behind the nearest pillar, and then follow the path down so that you approach the Wandering Nightmare from behind - kill it quickly before the Beast Patients get up. If you have your Torch out while dealing with the Wandering Nightmare, the Beast Patients will rarely close in to attack you, but you should still be aware of where they are just in case one gets brave. Exiting out of the smoke-filled room will take you to the streets of Old Yharnam, where your primary enemies are Scourge Beasts. Following the road around to the right will lead you to a large wooden door that can only be opened from the other side; to reach that area you'll need to travel through Yahar'gul, Unseen Village. There is an item near the door, however, so a quick trip down there is worthwhile before you follow the road around to left and continue onward. A lone Scourge Beast can usually be found patrolling along this alley, and while you may fancy your chances against a single one, it has some backup nearby just waiting to ambush you. Clinging to the side of the building near the end of the alley is another Scourge Beast, and it will drop down to join the fight if you battle the first one in the area below. Try to lure the first one away and fight it near the start of the alley to avoid this happening. When you head into the alley you can either use a ranged attack to knock the hanging Scourge Beast down, or, if you go around the side of the building and pick up the item there, it will drop down naturally. Just past the Alley you'll see a large house with an ornate door on the right-hand side of the street. When you get close to that door a Scourge Beast will come bursting through it, so make sure you're ready. If you go through the newly-opened door after defeating the beast you'll be able to climb up the spiral staircase inside, and halfway up there's a small room on the left with an item. Continuing up the stairs will take you to the other side of the one-way gate that you encountered near the Rooftops at the start of the area; opening this will create an extremely valuable shortcut back to the Lamp for you. Before leaving the area, however, make sure you continue to the top of the stairs, where you'll find another item. As you round the corner here you'll be presented with two paths, both leading in the same direction. The path on the left is obscured by smoke, and a female Ashen Blood Beast Patient is hiding behind it, with a Scourge Beast waiting on the other side of the alley. Going through the smoke and fighting the Beast Patient first is the best approach, because if you were to go along the other path, you'd still have to fight the Scourge Beast, and the Beast Patient would then come running out of the alley to join in. When you reach this area you should ignore the items near the top of the stairs, because a Wandering Nightmare is sitting nearby and will start running away when you get close; kill it first, and then come back up for the other items. Before heading in to face the Blood-starved Beast, you may want to enlist the aid of a friendly face that you encountered earlier. 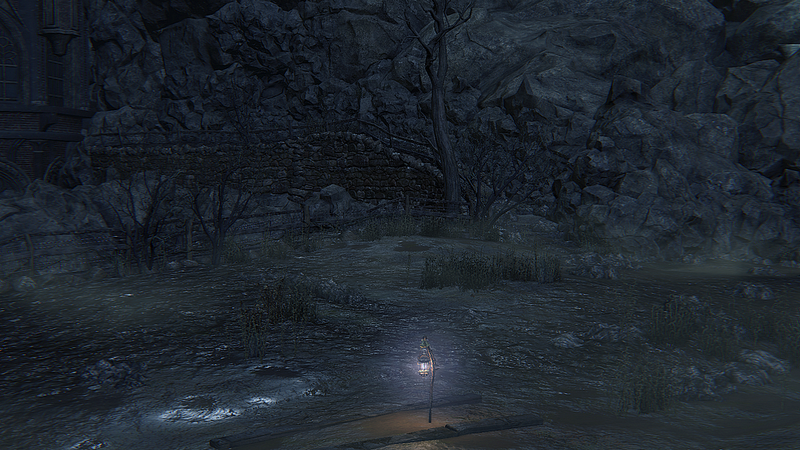 Just to the right of the path leading down to the Boss room you can find another brightly lit message if you're playing online and agreed to cooperate with Alfred back in the Cathedral Ward. If you have the Insight required, you can ring the Beckoning Bell to summon him. Alfred can help considerably with the fight, so if you're able, it's well worth bringing him in.